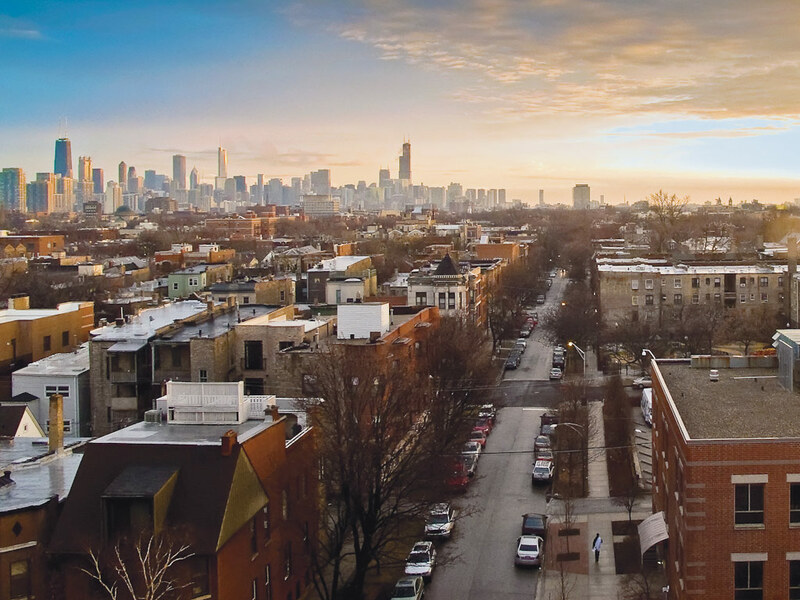 With work ranging from houses and storefronts to city-scale master plans, Chicago-based UrbanLab fluidly navigates architecture and urbanism. Regardless of scale, the studio addresses complex social and ecological issues with straightforward yet ambitious proposals—while managing to introduce a hint of levity in every design. Midwest editor Matthew Messner sat down with UrbanLab to talk about the Yangming Archipelago and how the studio works with water as a design component. The Architect’s Newspaper: How does UrbanLab approach water as a resource for architecture and urbanism? UrbanLab: Water, we believe, is the primary infrastructural framework and life-support system of cities. We think water infrastructure has the capability to unlock questions of how to best shape urban form and support healthy lifestyles. Today, the ways in which cities address their water challenges will be critical to their ability to prosper and grow. We see water scarcity as typically the result of shortsighted or poor planning strategies (or lack thereof) that use water only once before relegating it to waste. In this simple, linear model, water is typically castoff after its first use, at which time it becomes successively more polluted. We think this is crazy: Water is rarely so toxic that it can’t be salvaged and recycled again and again. As Buckminster Fuller remarked, “Waste is merely a resource in the wrong place.” So too is “waste” water that is routinely ejected out of cities instead of being kept and put back to work. Alternatively, UrbanLab’s water-based urbanism projects view water as part of a circular economy and ecology, where it keeps its value after each use, and ultimately returns to an original source. How does this play out in the studio’s projects? Each of our projects is a “bowl” of varying size and shape in which water circulates in semi-closed loops. Shifting to looping circular models that store water, from linear models that discard water, can replace scarcity with abundance, and help solve challenges of long-term supply and demand. We’re very interested to combine water infrastructures with architecture and landscape to find new urban forms. 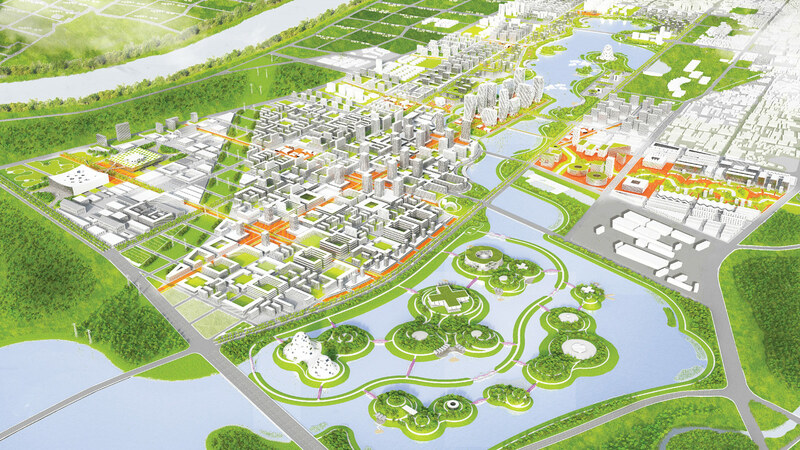 How is water-based urbanism deployed in the current Changde project? Our client, Changde’s planning bureau, aims to realize the plan in the next five to ten years. Currently, the project site is sparsely developed farmland bordered by high-density superblocks. At the center of the site is a highly polluted lake that is prone to flooding. Our primary design concept is a continuation of ideas we’ve been developing: To reimagine water as an amenity (not a problem) for people. 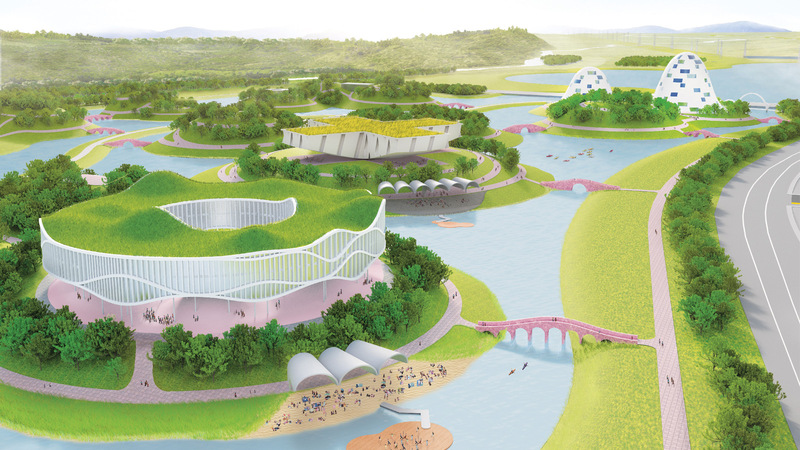 The lake is re-planned as a bowl-shaped “central water park” for the entire city. What are some the ecological aspects of the design? To help clean the lake, water-filtering infrastructures, or eco-boulevards—an idea we’ve been working on through several projects—pre-treat storm water runoff. Eco-boulevards are connected to additional water-filtering infrastructures such as tree-lined feeder roads, storm-water parks, and in-block rain gardens. Together, the streets and open green spaces are a porous framework of sub-bowls that naturally absorb and clean rainwater before [it enters] the lake. A fine-grained urban grid accommodates a mix of transportation options within and between eight new subdistricts. Compared to contemporary, car-centric urban grids in China that encircle gated superblocks, the geometry of our compact grid allows for a highly efficient bus transit system, reducing energy use and pollution. Bus stops and transfer nodes are planned within a 10-minute pedestrian walk to all new developments. In the lake, a group of new islands is planned. The “Central Business District Island” contains the most prominent new commercial buildings, and a chain of “Cultural Islands” contains new civic venues and gardens. The islands filter lake water and naturally enhance biodiversity and the living environment. As part of the Chicago Architecture Foundation’s (CAF) 50th anniversary, Sarah Dunn and Martin Felsen of Chicago-based UrbanLab put together an exhibition exploring visions for Chicago’s 50 aldermanic wards, titled 50 Designers, 50 Ideas, 50 Wards (opens May 24). Each ward, not to be mistaken for Chicago’s 77 designated neighborhoods, is a legislative district represented by a directly elected alderman. These 50 aldermen make up the city council. Unlike the neighborhoods, which usually represent a more distinct community, the wards have divided the city in such a way that a single ward often represent parts of as many as six neighborhoods. Often accredited to gerrymandering, it is not uncommon for an oddly shaped ward to span economically and culturally diverse areas. This is often cited as both a strength and a weakness of the system. In either case, the function of a ward is to give Chicago citizens a voice in city hall. The role of the alderman also directly affects architects and development, as the city council is often involved with the permitting process. 50 Designers, 50 Ideas, 50 Wards explores the relationship between design, the city, and the welfare of the people of Chicago. AN spoke with Dunn and Felsen about what the public could expect to see and why it is important to explore the city through design. The exhibition will be open at the CAF through December and is free to the public. The Architect’s Newspaper: Could you explain how the show came to be and what it is all about? UrbanLab: In 2016, CAF will celebrate its 50th anniversary. CAF is taking this celebratory moment to look out across Chicago with pride and, in the tradition of the great architects who have helped give our city its remarkable form and shape, ask, “What more can be done to better our quality of life?” And one step further, “What role can design play in solving the city’s problems at both the local and citywide levels?” 50 Designers, 50 Ideas, 50 Wards asks and attempts to answer these questions in a first-ever, ward-by-ward exhibition of ideas for building a better Chicago. Why was it decided to look at the 50 wards as opposed to looking at the more familiar neighborhoods, particular streets, or geographic regions of the city? Wards are an artificial construct, devised to divide and semi-evenly distribute populations for political purposes. So, each ward has a “boss” who represents a large group of people that share a ward but sometimes live in very different neighborhoods and communities. As a result, each of the city’s 50 wards has its own distinctive qualities but also distinctive opportunities for design interventions that could contribute to a better future for its residents. Some design solutions are unique to a given ward and its various communities, but some can be shared across multiple wards, and some can even be applied to the entire city. We are eager to present each of the 50 projects to each of the 50 ward bosses in a way that attracts their attention and—we hope—sparks their interests to start a larger conversation with the designers and their constituents. Can you talk a little about the process of finding 50 offices to participate in the event? The 50 comprises a large group of designers that we admire who do really interesting and intriguing work. With our partners at CAF—Lynn Osmond, Michael Wood, and Jennifer Masengarb—as well as Reed Kroloff, who advises CAF, we sought a mix of people of who know something about the many different parts of the city. Several of the designers live or work outside of the city’s central core or popular North Side neighborhoods. These designers have a unique knowledge of the out-of-the-ordinary places in Chicago. We wanted to tap into this awareness, to give designers an opportunity to present ideas and insights about parts of Chicago few know well. We began with a very long list of over 150 designers—all either living, working, or teaching in Chicago—and eventually pared the list down to 50 who we thought would be interested to uncover design opportunities in unusual places in the city. 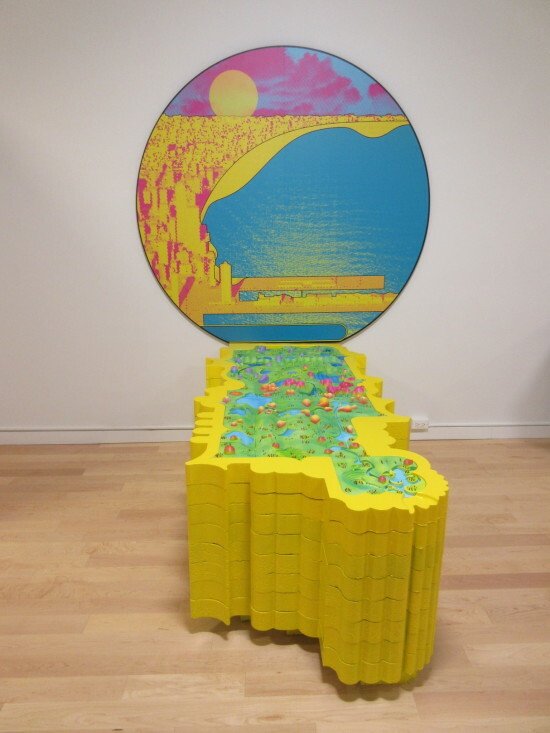 The result is a show that inventories an uncommon collection of ideas and unrealized speculations, as well as planned and built projects, that can enhance and in a few cases even begin to heal some of Chicago’s communities. Though we understand that the show is being produced to be accessible to the general public, what do you think architects might get out of it? We initially sought innovative, implementable proposals that place design at the heart of building and rebuilding Chicago during the next 50 years. 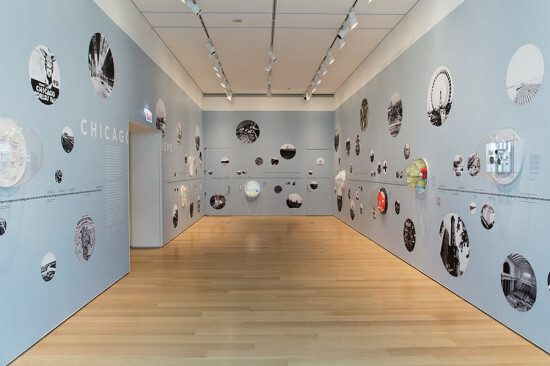 The premise of the exhibition recalls the creation of some of Chicago’s renowned urban plan, such as the Plan of Chicago (Burnham and Bennett, 1909), which proposed public parks, civic buildings, bridges, rails, piers, and roads across the city as an infrastructural investment in the future. We know many architects, landscape architects, urbanists, and designers in general have lots of ideas about Chicago’s future, and CAF is providing a unique venue to release these ideas into the communities. So we hope designers see this show as part of a larger effort— which includes exhibitions like the Chicago Biennial—to engage the general public in conversations about the future of our collective built environment. And we hope the general public sees that designers are willing collaborators ready to help communities brainstorm and visualize their current situations, and help devise actionable strategies of transformation. From the outset of planning the exhibit, we encouraged proposals that break new ground or establish new territory for Chicago to consider as it continually looks to improve the lives of its citizens through design. Importantly, we looked for projects that will have (or already have) a real physical and material presence in Chicago—projects the general public can (perhaps eventually) see, touch, or enter. What is the format of the show? What can the public expect to see in the show? Each designer gets a double-sided 30-by-42-inch board to display his or her project. We asked everyone to show one large highly realistic image (photograph or photomontage) to convey the project’s meaning and underlying value. Many of the boards also contain simple diagrams conveying formal and spatial concepts, and simplified site plans documenting project locations. One hundred and fifty words of text on each board briefly explain the project. On the back of each board, we include an aerial of each ward. For each aerial, the designers created a flag to identify project locations in each ward, and we’ve drawn a half-mile radius around each project site to inventory walkable neighborhood amenities. On the back of each board, we also show statistics such as locations of parks and various transportation options throughout each ward. We noticed that the 50 projects could be subdivided and collected into four main groups or “themes.” The “Figuring the Ground” group of projects are focusing on infrastructure projects like sidewalks, alleys, and the Chicago River. The “Stimulators” group is concentrating on community empowerments projects that address issues such as job training and educational venues. The “American Dream” group is investigating housing affordability and homelessness. And the “Pop-Up” group is looking at mobile buildings that can instigate local, temporary, or seasonal events. Four walls have been built to provide information about the four main themes.